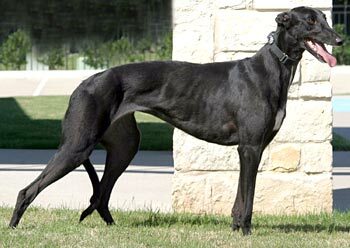 Girlie is a shiny, black, 1½-year-old female born February 11, 2008. Her sire is Super Lee, and her dam is Dreamy Babe, making her siblings Sissy and Cookie. 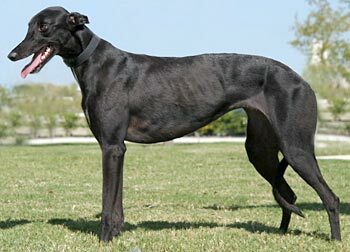 Girlie, like her sisters, was not individually registered with the National Greyhound Association. It was obvious early on that Girlie did not inherit any racing genes from her parents! She does have a beautiful white almost star on her chest, with a narrow blaze almost to her throat. Girlie’s cat test: Girlie was unsure of the house environment and tended to hang her head low and tuck her tail. She met all three cats, but after getting a sniff of one, she preferred to keep her distance. Mostly, she wanted to lay on a dog bed and make herself at home. Girlie passed her cat test. Close supervision is required when introducing a new dog to a household with cats, and a dog well-behaved with cats indoors may become very excited when she sees a cat outdoors. Hi! My name is Girlie, and my foster Mom is REALLY lazy, so she told me to do my own website write-up. 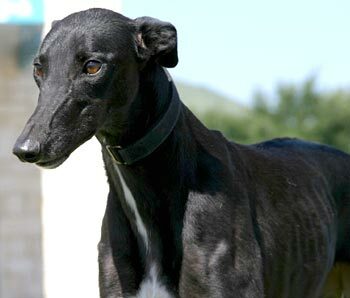 Would you believe I am one of the youngest greys that GALT has available for adoption right now? I won’t be 2 years old until February 2010! I am a very dainty little girl, but I have a BIG appetite. I haven’t been in a home very long, so I’m pretty skinny – but hey! How many gals do you know who have to work at putting on weight, rather than shedding a few pounds? It’s a greyt problem to have! Before coming to my current foster home, I spent a week in a home with several other greys and three cats. It has been determined that I am “cat trainable.” If you have cats, that means you will need to work with me a little, because I may not want to leave those little buggers alone at first. I kept trying to play hide-and-seek with my first foster Mom’s cats, and I also barked at them a little. I think you could call me “cat curious.” Maybe that’s why my tail curves up in a “question mark” most of the time! Mom says that several of Santa’s reindeer names would suit me as a nickname, but I think Dancer or Prancer would fit my personality the best. I am as graceful as Bambi when I prance around the pool in the back yard – and I haven’t even fallen in (yet!) I love to strike a play pose with my foster sis, Julie. We play quite well together and love to walk together on Mom’s double lead. The old man of the house, Hondo, always trails behind us – watching our backs in case any rabbits or squirrels try to sneak up on US! Even though I’m just a “Little Bit” (Mom’s other pet name for me), people tell me that I am very striking. I’m almost all black, with very expressive ears and just enough white to make me interesting! Mom loves the little crescent-shaped white star on my snout, and people are always complimenting me on the pencil-thin stripe that runs down the front of my neck – leading into a big pool of pure, white snow at the bottom of my chest. Actually, white is my favorite color! I love to hoard stuffies, but I especially cherish my little white bunny rabbit. I enjoy picking up toys out of the basket -- one at a time -- and taking them to my favorite dog bed. Then I just nestle down and snuggle in the middle of all of them! I’m a pretty quiet, calm girl. So far, that means I avoid the squeakies. I prefer the softest, fluffiest toys, and I am very gentle with them. I was a little bashful when I first came to live in my foster home – especially around Dad – but I am really warming up to him now. He says I have impeccable house manners, and I’m also a champ at riding quietly in the car. I don’t counter surf or dig in the trash, and I handle the steps by the pool quite gracefully, thank you very much! I got the hang of house training in no time – thanks to the good examples set by my foster siblings. I go into my crate willingly, and I slept through the night inside of it on my very first day here. What can I say? Does the word “perfect” come to mind? Can you imagine how CUTE I would look in a Santa hat under YOUR tree this year?